While 'Florida life' is paradise in winter/spring and even though this Florida native is quite used to the summer weather patterns, each July/August I am reminded (not sure why I forget so easily) the way this heat wraps around you and wishes to discourage any sort of outdoor activity. On the bright side, our day and night humidity is the factor that affords us growth of many variety of plants not seen elsewhere. The mild weather in other months keeps us growing vegetables and flora and fauna throughout the autumn and winter months. Isn't all of life a big trade-off? Always the pros and cons to deal with. 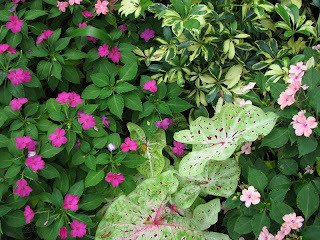 Let's have a look (above) at one view from the back garden and you will note it reveals numerous combinations of colorful foliage, shades of green, a variety of texture, and a few flowers taking us through these summer days with color blends and texture. I've walked around the garden with a tight angle on the camera lens to view some of the groupings of duos and trios up close. If you'd like to join me we'll examine the area with a keener eye (some above and some below). I certainly don't have it all figured out yet, but lots of trial and error over the years has been the case learning what works together to bring any excitement to the garden this time of year. The intensity of long summer days can be very stressful on most annuals. This summer the fairly regular rains have helped the garden tremendously compared to last year. The grass hasn't appreciated it as much as the foliage and is now suffering with all kinds of fungus... again... pros and cons. I'll take the rain any day even though it will take a while for the grass to recover. Thanks for having a look at a few of the combinations keeping the garden perky through these dog days of summer. Always enjoy having you along... wish I could offer you a seat in the garden with a tall glass of iced tea (and a fan... or two). ***I'm happy to ID any of the plants upon request. I love your blog! I'll take a walk through your gardens any day. Meems, I love your garden though I would hate the heat. We once visited a great tropical dome where it was very hot and humid, I just cann't imagine living in it. I love your photos, there are such an assortment of "house plants" all looking better for having such lovely neighbours. I love your positive view on life and your garden. You are always so positive, looking on the bright side. I love your garden Meems. The combinations of color & texture is fantastic. Your tropical setting is so lush & beautiful. As always, I'm inspired by your garden combos. I was wondering if you have timed irrigation. A niece of mine lived in Florida and not only was her garden irrigated but she dug a well for that purpose. great to see all the amazing duos and threesomes in your garden. they are so lush and green. compared to all your lushiousness we are all dry and weepy here. How gorgeous and lush your garden appears. We have had lots of rain but without the sun or heat so everything just looks soggy! We surely got no rain from Fay, which I thought so ironic. We have had worse afternoon thunder storms this summer. However, according to weather reports, the east coast of Florida is inundated with high water, flooded areas, impassable streets, and damage to lots of mobile homes. Tropical storms and hurricanes tend to restore depleted water levels due to drought, and so Georgia is even hoping Fay blesses them with her visit of abundant downpours. Like your post stated, the pros and cons of life, and rainfall, and gardening. May I add, yours is always a treat to visit, by blog or just stopping by. P.S. to Marmee - the reports also indicate lots of showers for Nashville, so your prayers should be answered in a couple of days! Your garden is a joy to visit! 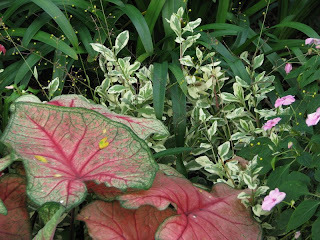 You are a master of combining plants and using texture, color and form! I am so glad you were spared Fay's wrath, but I do know you are still deep in Hurricane season. darla: Thanks for stoppin in this morning to take a gander... come back anytime. sylvia: I would think the heat would 'get to' anyone not accustomed to it. For me, I couldn't imagine living anywhere with grey skies... we have sunshine/blue skies/green plants all year long which is cheery and invigorating. I guess it is all what you get used to. AND important wherever you are to look on the bright side! Nancy, thanks it's one of my favorites too... the polka dot plant is a must for interest. 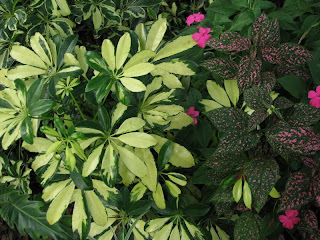 Perennial Gardener: You LOVE my garden! What a nice thing to say... you can be my friend for life! :-) Seriously, it is very fun to share it with you. mother nature: Thank you, I'm glad you like the combinations. Yes, we have automatic inground irrigation that is set on a timer and the water is from a well. All our household water is from the well. Only we are on county water restrictions. Which means we are not allowed to water with any kind of irrigation except once a week. We are allowed to water by hand. I spend quite a bit of time watering by hand the flowers and container plants. This year we've had more rain than last but in this heat we can't go for more than a day without rain and it's back out to hand water. Marmee: That's how we felt last year and really right up until June when we finally started getting some rain. So I know what you mean. It look like your prayers will be answered with some rain from Fay. Let's hope that is all she brings in her path. 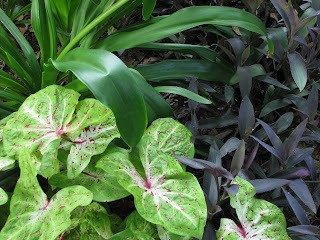 Patient Gardener: The rains have not been as good for some plants. It does tend to beat down some of the taller perennials that are out in the open. Even some of the plants I've put in the ground for drought tolerance are not enjoying the rain. I guess you just can't have everything. Here's hoping you have some drying out periods so your plants can have some balance. Mom aka Senior Gardener: If the tropical storm only brings rain and some winds it is usually a nice respite from the lower water tables. I do hope the southeast gets some good rain out of Fay... it could be a blessing to so many drought ridden areas. That was so well written and a refreshing read. We need rain so badly. 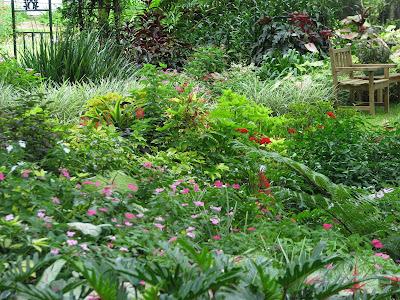 So, it's nice to see a garden so lush and green with a caring gardener to love it. 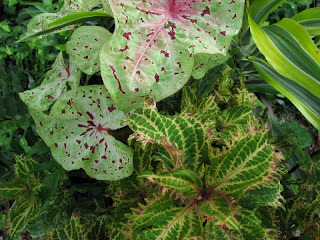 I sure wish I could have those caladiums. Your post some pretty compatible couples! Cheryl: True...you bring up a very important fact... we have to travel to enjoy the seasons. It is the one thing I would LOVE to change but I guess one can't have both sunshine all year and change of seasons. anna: I think there is still hope for you getting some of the rain from Fay. If not, here's to N.C. getting some of its very own. I'm looking forward to your caladiums next year... I think you are going to like experimenting with them at your new garden. You have a great eye for colour and design. And it carries over nicely into your photography, as well. We've actually had a few cool nights up here, but it's back to normal now. We're getting a little rain from Fay's edge this afternoon. If she takes the predicted route, we'll be getting a lot more before she's done. 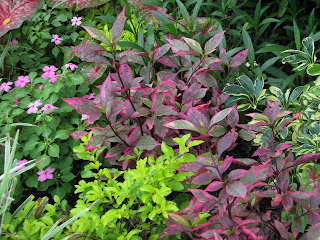 I love all your color combinations in the garden. So beautiful! Meems - I wish we were closer neighbors. I'd love some cuttings from your garden!!! What are the lime green striped plants? Your garden looks realatively shady. Does it get much sun or do you intentionally try to keep it shady? Meems, it's such a delight to stroll around your garden. 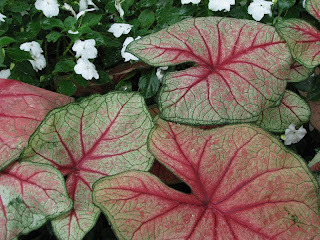 Your caladiums are amazing--and the combos..? They take my breath away!! sophiemae: "Thanks ever so" :-) Cool nights are very much looked forward to here... I'm always envious when I hear of your change of weather but after all you are way up there in the Narth! We will be making our way up yonder soon for football season is upon us again. leslie: We haven't had as much as whatever 'used to be normal' but more than last year. It does seem as though rain works so much more proficently than even automatic irrigation. It covers better and the earth smiles back after that heavenly liquid descends. WG: Me, too... although you aren't THAT far away. If you're ever down this way just let me know... would love to share. My yard is full of large stands of oak trees. They are tall enough that they provide a wonderful blend of filtered sunlight and direct sunlight... depending on the season and the time of day of course. 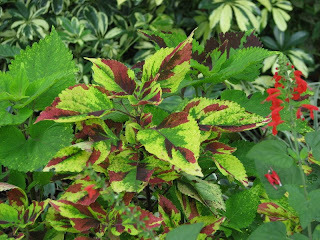 I have planted accordingly and attribute any success I have to that and the fabulous soil that has been cultivated over the years using mostly oak leaves and grass cuttings compost to mulch. 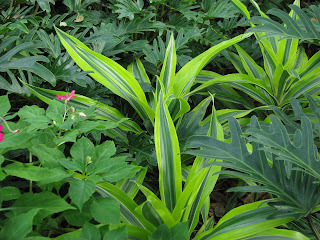 Re: the green stripe plant is lemon-lime dracaena... I am currently quite in love with its versatility and ability to brighten up just about any grouping... it does require filtered sunlight or mostly shade... does better with some sunlight though. Hope that answers your questions... thanks for stopping by... hope you guys do okay over the next day or two with all the rain expected from Fay. Kanak: It's a delight to have you from half way around the world. Thank you for visiting and thank you for letting me know you enjoyed my garden... now breathe. Those are some great combinations. I had to laugh though, because most of your flowers only grow as houseplants over here in Oregon :P I'm so jealous! lacey: Thanks for stopping by... it is ironic how my every day garden plants can be your house plants. Interestingly some of these started in my house or covered patio and I took some chances with putting some of them in the ground initially. When it worked I was hooked. Hi Meems, your compatible couples look very happy together. It's always a joy and an inspiration to take a stroll through your gorgeous gardens! I so enjoy my online visits to your beautiful gardens. 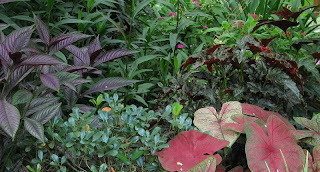 Living in central florida, your gardens inspire and inform. Thank you! Hi Meems: I am brand new to your fabulous blog - and fairly new to zone 10 (Venice, Fl). Our lot is 99% full sun and I am having a heck of a time finding plants to grow - I think it is because the soil is sand. I am going to follow your "bed" plans and see how that works for our garden. Thanks for the learning curve.